Staff Sgt. 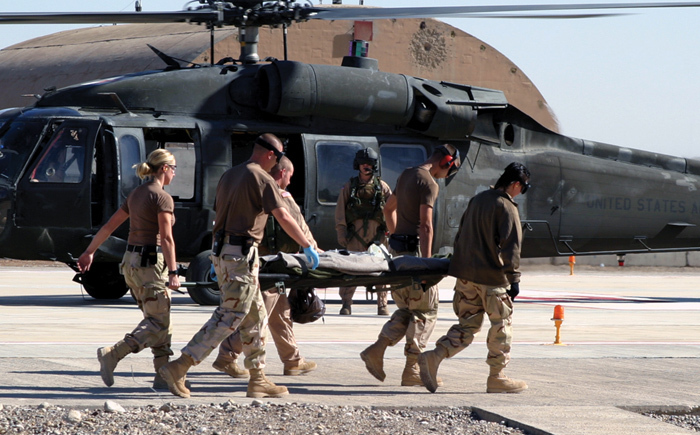 Jennifer Long (far left) and members of the Expeditionary Medical Support unit remove a patient from an Army UH-60 helicopter. Photo courtesy Staff Sgt. Jennifer Long, 108ARW/MG. The 108th Medical Group, part of the 108th Air Refueling Wing, has deployed numerous personnel in support of Operation Iraqi Freedom. Staff Sgt. Jennifer Long, a medical technician with the Med Group, spent four months in Iraq, where she assisted in administering medical aide to injured U.S. personnel alongside Staff Sgt. Bridget Fitzsimmons, another Med Group member. In Iraq, Long gave immunizations, screened sick call patients, ran test labs, administered first aide, went out on ambulance calls, assisted in traumas, taught first aid classes to civilians, headed up the flight line driving program for all Army and Air Force personnel, and sent and received patients through air evacuations and medical evacuations. "I gave some first aide classes to civilian contractors, and we treated a lot of Army and civilian personnel," she said. Long had previously spent a year in Iraq while serving in the New Jersey Army National Guard. This time around, she was in a different branch of the National Guard, but her duties were the same. While Long was busy in Iraq, her coworker Sergeant Fitzsimmons was sent to Pakistan for two months to assist those injured by the earthquake. She ended up receiving an award for her efforts in Pakistan. "Bridget is a great medic, and did great things out there," Long said. Despite the dangers and stress of working in a war zone, Long found some things that she could appreciate. The best part of the deployment was helping to heal the soldiers, and seeing much less serious injuries this time around, Sergeant Long said, adding that they just wanted to go and do their job, and help serve the soldiers and Airmen over there. While she received a rewarding feeling from doing her job, the whole reason for her job was what she identified as the worst part of the deployment. "That was seeing the terrible injuries to such young, healthy and brave people." Long worked with a variety of military members at the base's Expeditionary Medical Support, where the injured were first received. "We had an Army liaison working with us at EMEDS, and for a short time we had a Navy Corpsmen filling in some shifts with us," she said. 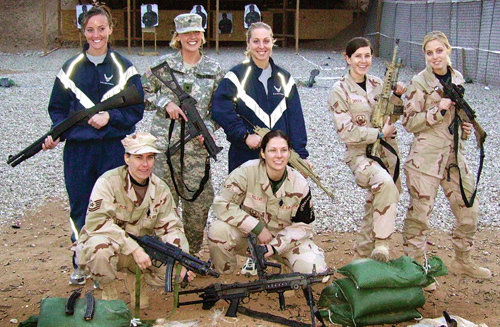 During her free time, Sergeant Long kept active, participating in events with personnel from other branches of the military. "I ran some five and 10K's with people from the other branches," she said. While Long's deployment, another Med Group team had already gone and come back since then.